Our friend M (one of A's friends from his student days, and a different M to aforementioned School Friend M who we dined with at Pig and Butcher the other week) is about to be sent off to Singapore for 6 months for work, and so we took the opportunity to have him and his girlfriend S round for a casual Sunday night dinner before he went. One thing and the other meant that the weekend had been a bit hectic, and that combined with the fact that the dinner was decided at fairly short notice meant we didn't have time to prepare anything too fancy. 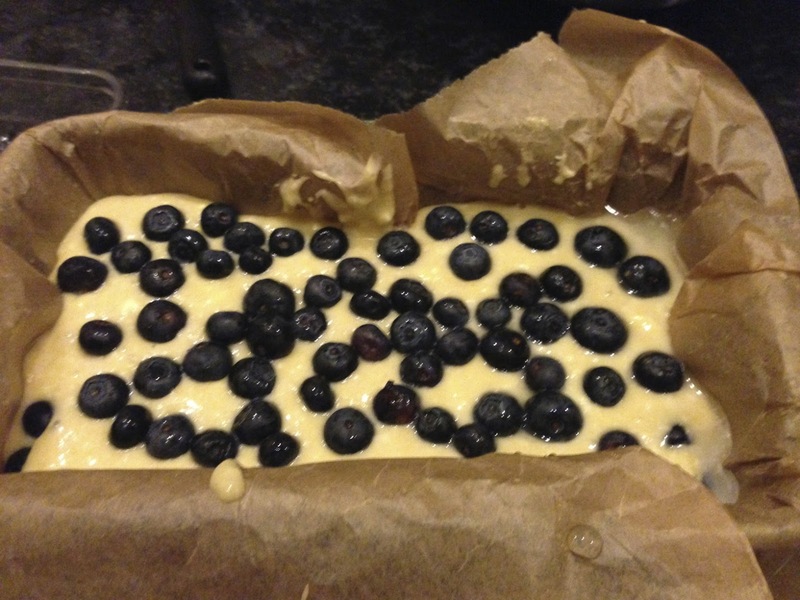 We did, however, have a couple of hours before they arrived and ingredients for a cake - and so we decided to try our hand at a Blueberry and Lemon Curd Cake (or, as it shall henceforth be known, M's Farewell Cake). We took the recipe from BBC Good Food after it caught C's eye - blueberries and lemons being two of her all-time favourite flavours. We also imagined, though, that it was quite inoffensive and would hopefully have quite wide appeal. 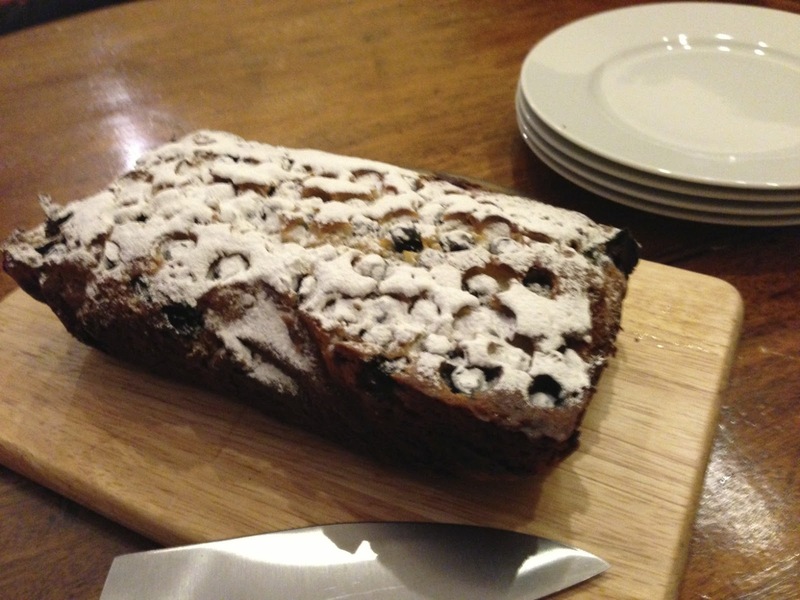 Although we'd planned to have time to ice it and pipe 'Farewell M' on the top, unfortunately it ended up taking a little longer than expected to bake and we had to serve it up as it was, with a little icing sugar sprinkled over the top. Having said that, we're pleased to say it got the thumbs up from both M & S (we've decided to go with the initials this way round as opposed to, er, S & M, after much debate). Flatmate N and Flatmate T (a new addition to the blog, as A's just moved into a different flat in the East End with his old flatmate and another friend) were also fans, and obliged us by having a piece as well, with Flatmate T complimenting us on the texture - soft, light and spongy, but with a bit of stodge too thanks to the Greek yoghurt. Heat oven to 160C/140C fan/gas 3. Grease a 2lb loaf tin and line with a long strip of baking parchment. Put 100g yogurt, 2 tbsp lemon curd, the softened butter, eggs, lemon zest, flour and caster sugar into a large mixing bowl. Quickly mix with an electric whisk until the batter just comes together. Scrape half into the prepared tin. Weigh 85g blueberries from the punnet and sprinkle half into the tin, scrape the rest of the batter on top, then scatter the other half of the 85g berries on top. Note: we actually doubled up the amount of blueberries, and would recommend doing so too; the flavour was fuller. Bake for 1 hr 10 mins-1 hr 15 mins until golden, and a skewer poked into the centre comes out clean. Cool in the tin, then carefully lift onto a serving plate to ice. Sift the icing sugar into a bowl and stir in enough lemon juice to make a thick, smooth icing. Spread over the top of the cake, then decorate with lemon zest if you like.